If you plan to dip your toe into the virtual reality (VR) waters, you probably are curious about what kind of VR devices you can lay your hands on. Two of the major companies to emerge in the VR world are Lenovo and Oculus. Take a look at their VR device offerings. The Lenovo Mirage Solo is similar to the HTC Vive Focus. It’s an all-in-one standalone headset that doesn’t require any extra computers or mobile devices to power it. Similar to the Vive Focus, the Mirage Solo will allow 6DoF via a pair of front-facing cameras, allowing inside-out positional tracking. This setup enables you to wirelessly move about the virtual worlds the same way you navigate the real world. With a built-in display, a 3DoF controller, and positional tracking using Google’s WorldSense technology, the Mirage Solo eliminates the need for any external sensors. The headset is also built on top of Google Daydream technology, allowing the headset to tap into Google’s existing Daydream ecosystem of applications. The Mirage is set to release sometime in the second quarter of 2018. The original price point was set above $400, but Lenovo has since adjusted this and is looking to aim at a price below $400. It will be interesting to see where the price finally lands. It’s clear, however, that companies such as Lenovo are keeping an eye on the casual market to try to determine the correct price point to target that market. The Oculus Santa Cruz was originally announced at Oculus Connect 3 in 2016. Oculus seems to be positioning this new product as a mid-tier headset similar to the Vive Focus and Lenovo Mirage Solo. However, it promises a higher-end VR experience than current mobile VR models such as the existing Gear VR or upcoming models such as the Oculus Go. However, it doesn’t quite deliver the same level of experience as the PC-powered Oculus Rift. Oculus co-founder Nate Mitchell has confirmed this to Ars Technica, framing the Santa Cruz as the mid-tier product in Oculus’s three-headset strategy for VR hardware. Like the Focus and Solo, the Santa Cruz is a self-contained VR headset. Instead of being powered by any external device, it contains everything you need in the headset itself. No more tripping over external wires or cords leading to your device. It purportedly will allow 6DoF for motion and positional tracking via the headset’s inside-out tracking. Similar to tethered headsets that rely on sensors, Santa Cruz will display a virtual grid if you come too close to a physical barrier such as a wall. The Santa Cruz also appears to be designed to utilize a pair of 6DoF wireless controllers, which could put its motion controls a cut above other mid-tier current- and next-generation wireless headsets whose controllers only allow for 3DoF. Santa Cruz’s four arrayed cameras around the edges of the headset allow for a very large area in which to track the controllers’ position. Some current-generation headsets that utilize inside-out tracking for their controllers can cause tracking to be lost if the controllers move too far out of the line of sight of the headset sensors. Oculus appears to have taken steps in order to solve this issue with the Santa Cruz. The Santa Cruz appears to be following other headsets in regards to audio as well. The Go and Santa Cruz both utilize a new spatial audio system that, instead of relying on headphones, will place speakers onto the sides of the headset, allowing audio to be broadcast not only to the HMD wearer but the rest of the room as well. There is still a 3.5mm audio jack for those who prefer headphones, but the convenience of speakers is a nice touch. On the surface, the Santa Cruz sounds like a promising device. The biggest question marks surrounding the Santa Cruz at the moment are timeline and final specs. Oculus has been silent on final product specifications, release date, and so on, so no final product specs can be listed. Oculus is shipping devices to developers in 2018; this would lead most to believe that the final hardware specifications are close to being locked in. Based on previous products’ timelines between developer release and final release, a good estimate for consumer release date for the Santa Cruz would likely be early 2019, though only Oculus knows its final release date. With the current generation of VR headsets, audio consumption has often been cited as one of the reasons VR experiences feel like solitary experiences. Most current-generation headsets come with or require a set of headphones to experience what’s happening in VR. This can lead to a very immersive experience for the wearer but effectively shuts the wearer off from the outside world, completely covering his eyes and ears. Many of the newer headsets appear to be leaning toward implementing speakers on the headset itself alongside headphone audio ports. This will enable the headset wearer to still have at least an auditory connection to the outside world, as well as let others hear what the wearer is currently experiencing. 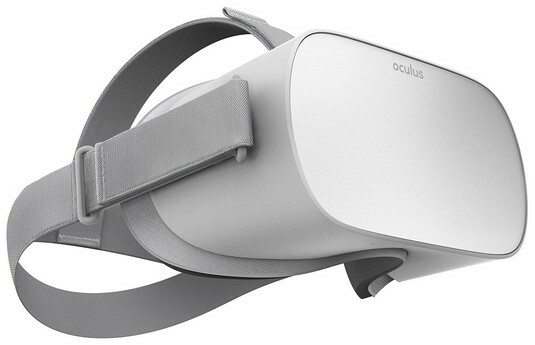 Oculus appears to be targeting a different crowd with its Oculus Go standalone headset. Whereas the Mirage, Focus, and Santa Cruz all appear to be positioned as mid-tier options between the existing desktop and mobile VR markets, the Go looks to take over (while up-leveling) the current mobile VR experience. The Go is a standalone headset that doesn’t require a mobile device. It offers 3DoF, providing rotational and orientation tracking but not the ability to move backward or forward physically in space. This makes the Go more suited to seated or stationary experiences. Although the Go doesn’t appear to offer a number of the features that the Mirage and Focus do (most notably the addition of 6DoF tracking), Oculus likely hopes to use a lower price point (around $200) to lure in those entry-level VR users who may have previously considered purchasing a Gear VR or Google Daydream for mobile VR experiences. This image depicts the new form factor of the standalone Oculus Go headset. Similar to other standalone headsets such as the Mirage and Focus, the Go controller will provide 3DoF tracking. Much simpler than the current Rift motion controllers, the Go controller aligns itself more closely with the current Daydream or Gear VR options. The Go will have its own library of games but will also offer support at launch for many of the existing Gear VR titles. 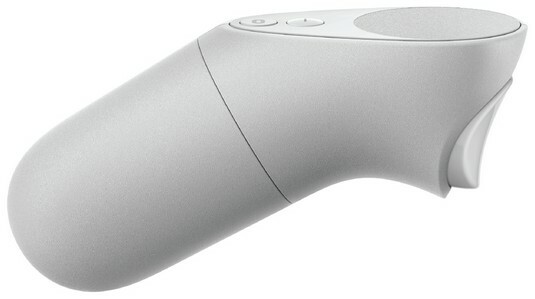 This image displays the new Oculus Go controller. The Go controller will be slightly different in form but offer the same functionality as Samsung’s current Gear VR controller.